Dresden has the most famous Christmas Stollen, but you can bake your own with little trouble and a few hours time. 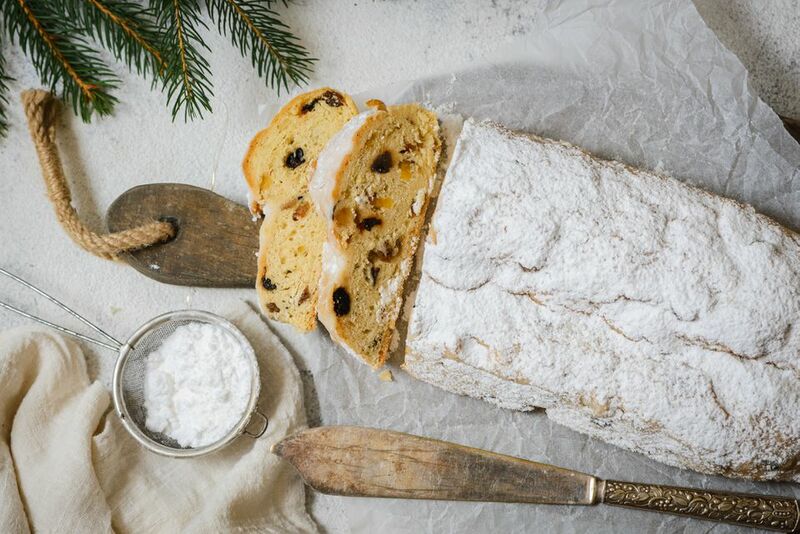 Christmas Stollen, or Christstollen, is full of nuts, raisins, and candied fruit. Soak raisins, candied fruit and almonds in rum overnight, stirring occasionally. Dissolve yeast in warm milk and a pinch of sugar. Proof for 10 minutes, or until bubbles form. Mix flour, egg, yeast mixture, sugar, lemon peel vanilla and salt with a spoon or in a stand mixer using the dough hook for several minutes. The dough should just come together and not be very smooth yet. Remove from bowl and set aside while you do the next step. Cream the butter and 2/3 cup flour with the nutmeg and cardamom until smooth. Add the yeast dough back to the bowl and work the dough with a dough hook or by hand until the butter and flour mixture is completely incorporated. This should yield a smooth dough. Let dough rest, covered, for 30 minutes. Turn dough out onto a tabletop or lightly floured board. Knead in fruit and chopped almonds. Let rest for 15 minutes. Return dough to floured board and form into a rectangle with two high sides and a dip in the middle. Fold 1/3 of the dough over to the middle, filling the dip. Pat into a stollen shape. Fold a piece of aluminum foil several times on the two long ends to build walls for your stollen, to help hold its shape while baking. You may also use a stollen pan if you have one. Let stollen rise for 30 minutes in a warm place. Preheat oven to 350 F. Dot the top of the stollen with butter. Bake loaves for 35 to 45 minutes, or until loaves are golden and done. Cover with foil if it begins to brown too much. Brush warm loaf with butter and dust thickly with powdered sugar. Cool on rack. Wrap tightly in foil and keep in a cool place for 2 to 3 weeks to ripen. If made a few weeks in advance of serving it mellows and softens and is very good.